As I am leaving tomorrow morning for a five-weeks photo expedition to the South of Morocco, together with the friend and colleague Ugo Mellone, I want to post now the next picture for the month of March. 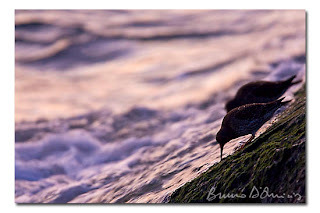 These are two Purple sandpipers photographed at sunset on a recent trip to the Netherlands. It's incredible to see how these little waders can master the crashing waves of the North Sea while feeding on the very slippery walls of a local pier. And, before I will be back to Europe, hopefully, with a load of new images, I wish all of you a nice end of winter (was it this one, by the way? ;)) and an even nicer beginning of spring!